“A MOMENT of real pride” is how National Portrait Gallery director Angus Trumble introduced the newest exhibition of fine work done by 10 selected female artists, which is open to the public today. 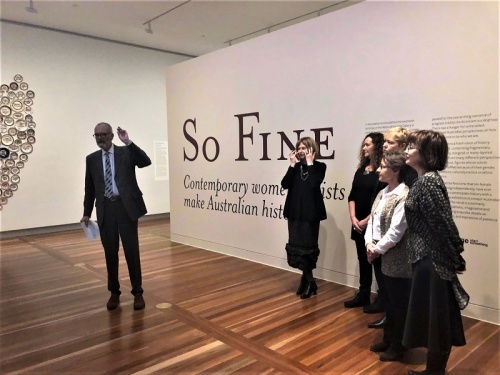 In “So Fine: Contemporary women artists make Australian history”, the artists reinterpret and reimagine Australian history. There was, Trumbull explained to those present at the media launch, an element of congruence in the choice of subject for the gallery’s celebration of its 20th anniversary, making history of its own kind, for the 10 women artists who had been invited to tell “stories that have escaped notice” about Australia. 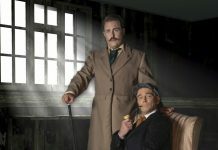 The artists, working with co-curators Sarah Engledow and Christine Clark, had “got excited” and the show grew into a unique exhibition of works which, since each artist owns copyright on the works, will probably never be seen together again. “There is no one history,” Trumbull told “CityNews” after his introduction, noting that the current academic trend towards micro-history meant the people were now telling “big history through a small lens”. An example of this is in the work of Wathaurong-Scottish woman Carol McGregor, who has assembled painted, stitched possum skin cloaks and vessels, feathered pencils, woven hair and wire baskets to evoke stories waiting to emerge from Indigenous people whose personal histories have been suppressed. For a work about the history that has yet to be written, McGregor sourced 6000 pencils from “Staedtler” (just before the company moved offshore) to comment on the “Great Australian silence” about its true history. “As artists we have a lot of stories,” she told “CityNews,” explaining that her work, unlike some of the others on show, was a survey of already-completed works, to which she had added refinements. McGregor explained her explorations through various media of the “materiality” involved in creating all her work, pointing out artworks created though metal weaving and others involving gum nuts and emu feathers. 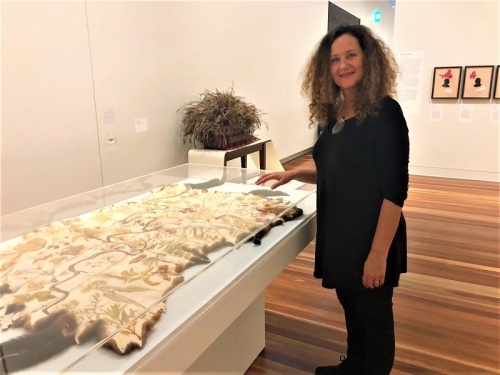 The two large possum-skin works embossed ochre-painted images of natural flora, later burnt into the skin, have been the subject of community projects where she showed other female artists how to create such works.